I love the world. Love it. Love how big it is. Love how much there is to see. Love how much there is to do and and all the different and interesting people which make travelling such a joy. We went grocery shopping in Aqaba the other day. Just looking for lunch supplies. The supermarket was much like any Woolworths or Coles though probably a bit more IGAish than anything else (except with a huge bulk spices section). I flashed a smile at an older local gentleman as we went and so he stopped for a bit of a chat. ‘Welcome Jordan’ he said. ‘Thanks’ I replied. Jordanians seemed to welcome us to Jordan wherever we went and it never grew old. ‘Have you met King Garoo?’ he went on to ask with a quizzical look on his face. Who is King Garoo and why would I have met him? I wondered probably with a slightly puzzled look on my face. Then he held his arms in front of his chest with his wrists hanging limply and started bouncing a little. ‘You know King-ga-roo’ he said again with a little laugh. ‘Aaah, Kangaroo’ I laughed. I wasn’t sure if he was messing with me but regardless he seemed to mean it in good humour. Aqaba, the home of humorous Arabic gentleman, is a short drive down the speed bump laden Kings Highway from Wadi Rum. I’ve never been to a country with such a love of speed bumps. Speed bumps everywhere. Big roads. Little roads. Everywhere. But I digress. Aqaba is Jordan’s south coast. A weekend bolt hole on the cobalt blue, Red Sea. A sparkling stretch of water surrounded by a barren moonscape of hills and mountains. We checked into the Almarsa Village Hotel about 15 minutes outside of Aqaba itself. There was nothing there except for the hotel with its huge blue pool, a few dive centres and the coarse sandy beach-like area across the road. Across the water was Egypt. It’s still a novelty to be peering from where we are into other countries as we travel. Turns out not all the world is its own continent sized country. View from the pool – that is Egypt over there! We lazed by the pool for a day and half, reading books, writing blogs and watching with curiosity and mild alarm as 4wds with huge, mounted machine guns drove up and down the road in front of us. We ate at the hotel, because we were too lazy to go anywhere else and because the Fattoush salad was really good. The young waiter there took a shine to Amy. First he mistook her for Italian, then he played songs for her on the sound system (Spice Girls – go figure?) and then told her how soon the boys would be lining up to meet her. I stole a sideways look at Amy. She is growing up, but not that much! It took a day and half before we could summon the strength to rent snorkels and wander across the road to the beach. You have no idea how tough this travelling caper is! On went the snorkels and out we went into the Red Sea, two by two. It was gorgeous. Like snorkeling off the beach at Ningaloo, coral lines the shores to the North and South. The water was crystal clear, the coral appeared to be in good health and there were loads of fish. I could have stayed longer, but not on this occasion. It’s curious how even with a year off time drives you on. It drove us up the highway past numerous check points with police toting scary looking rifles. Whatever it is they were looking for, we weren’t it. I did little more than open my mouth, scarcely even said anything, before they smiled, welcomed us to Jordan and waved us on. Perhaps it’s travelling with a family. It changes the way almost everyone relates to you. Or maybe I’m just a whole lot friendlier looking than I was 20 years ago. It could be the grey hairs turning me into a distinguished elderly gentleman, like the one back in the supermarket. I had to drive carefully heading north, making sure I stayed on the road and didn’t let magnificent views over the Rift Valley distract me and send us all careening off the side of a cliff. 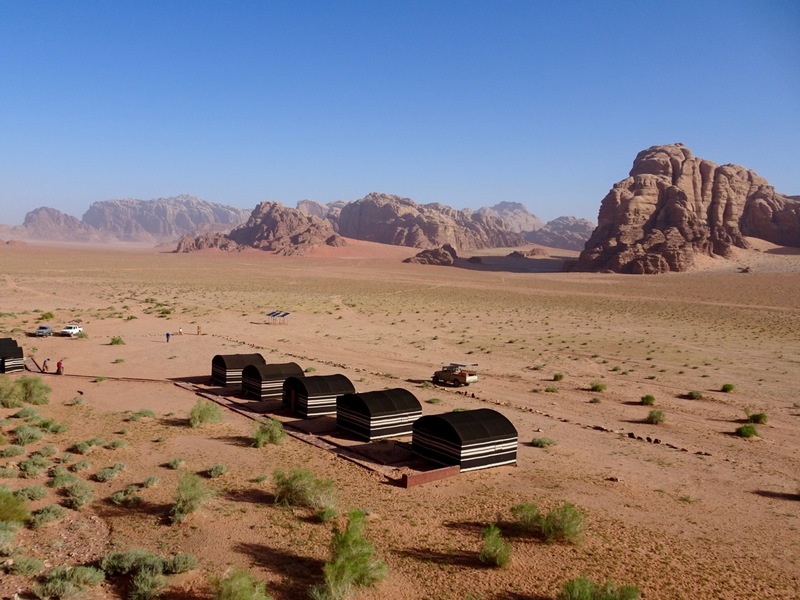 We headed to Dana Village, ‘a picturesque cluster of stone cottages huddled together on a cliffside outcrop, Dana Village has rightly become celebrated as one of Jordan’s loveliest hideaways’ (Rough Guides). We got there, and I didn’t believe we were there. From the lookout above it didn’t look like a place four Aussies of no interest to Jordanian authorities would hang out. But that’s the thing about travelling, nothing is ever what you expect and nothing is ever as it seems. We stayed in a very cute little stone bungalow at the imaginatively named ‘Dana Hotel’. It looked out over a few crumbling buildings and then into the long steep and deep gorge heading down to the plains below. People come to Dana to hike, but we only managed a 1-hour stroll across from the village to the terraced gardens with tall poplar and olive trees. It felt more like Tuscany than Jordan, except for the haunting calls to prayer that sung out across the valley at intervals we couldn’t quite work out. When we weren’t strolling we were reading, doing school work, playing cards (hearts) or eating flat bread and hummus and sipping on more sweet Bedouin Tea. I love sweet Bedouin Tea. 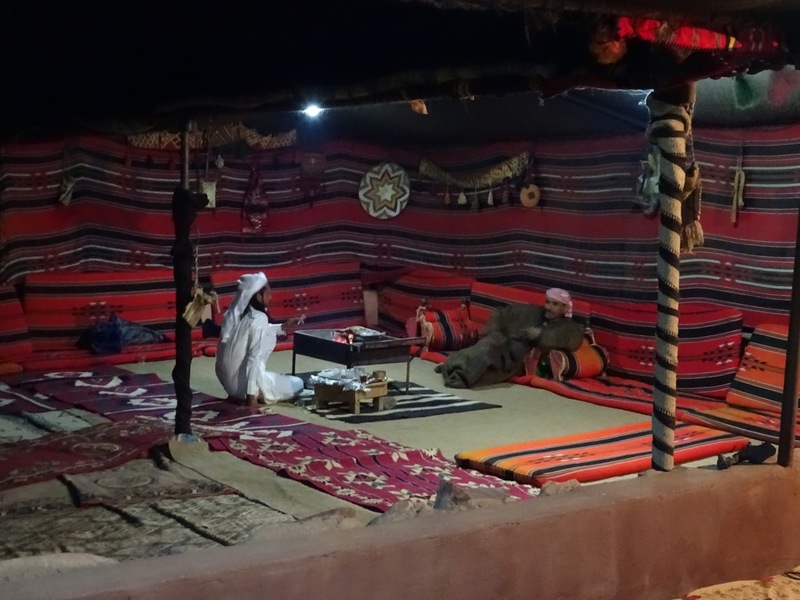 It’s so… Bedouin. We headed north again from Dana, mostly because east would have sent us into Israel, West into Iraq and we had already explored the south. The Jordanian love affair with speed bumps continued to occupy my attention in equal measure with mental calculations on how to make sure we returned the hire car with zero petrol left in it (as we picked it up) but without stranding ourselves in the process. The drive was magnificent. 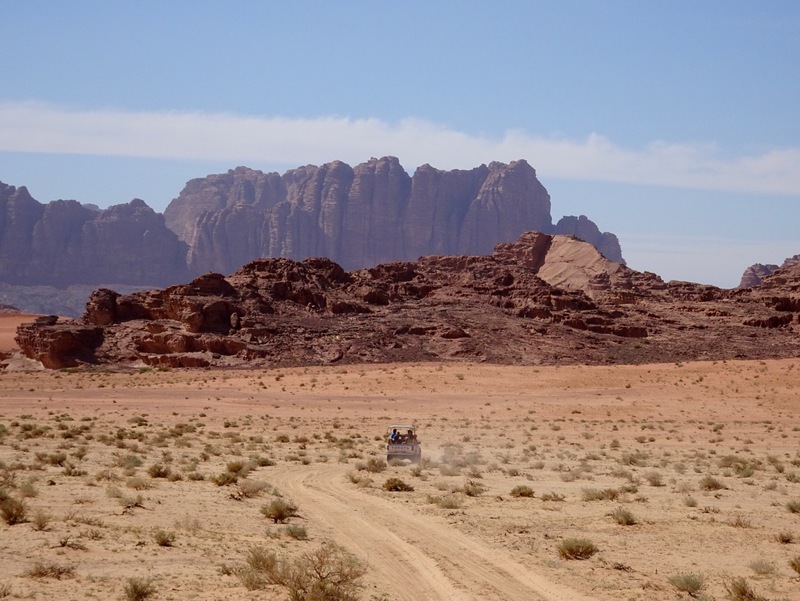 If you’re headed to Jordan, don’t go up and down the main highway, its bumpy and uninspiring. Drive the smaller roads they’re smooth and… inspiring. You can’t avoid the speed bumps so don’t try. One valley enroute took 45 minutes to drive from one side to the other. It reminded me of the Flinders Ranges. From a high point at the Al Karak Castle we started a long descent to 400 metres below sea level and the Dead Sea. We covered the science curriculum on the way down with much discussion on air pressure as the sides of our drink bottles collapsed. ‘How come you know everything?’ asked Oliver. ‘It’s a gift’ I replied. The Dead Sea doesn’t look dead on approach. It looks more like the Whitsundays, except the white sand is salt and there is no vegetation. There is also much to be said for Australia’s approach to maintaining public access to beaches. It’s not entirely clear where to sink yourself into the salty water of the Dead Sea. We settled on the outrageously expensive ‘Amman Beach’ (about $100 for the family). It was only expensive for foreigners though. Apparently India is not the only country to milk tourists for all they’re worth at major attractions. Enough said, otherwise I’ll get started on a rant which will make me grumpy and no one here will enjoy my company for the rest of the day. After changing we headed straight for the salty waters. No doubt some of you will have been here yourself and so don’t need me to tell you about the bizarre experience of wading into water where you can’t sink. It’s weird. In really fun way. According to all the laws of physics and nature, unless you kick your legs and wiggle your arms when swimming, you should sink. It’s the way the world works and its not to be questioned. But here… no… as you all know, that’s not how it works. In fact, if you put your legs straight beneath you and your arms in the air, my favourite position for dabbling with the buoyancy effect of a 30% salt load, you bob around with your head shoulders and half your chest comfortably above the surface. Photos were taken, as you would expect, including of me pretending to read a book while floating on my back. The book was really a catalogues for skin care products that I found on the shore. No doubt it appears in the photos of the previous 200 or so visitors to Amman Beach as well. Look! No hands or feet! We rinsed off in the two very large pools which went some way towards justifying the cost of entry to the ‘Amman Beach’ complex. It came as quite a shock when we jumped in and sunk like stones. Fortunately, Amy and Oliver were off having too much fun to ask me why salt increases buoyancy. Something to do with the density of the water no doubt, but I could have been caught off guard and appeared less than omnipotent. Not the look I’m going for. 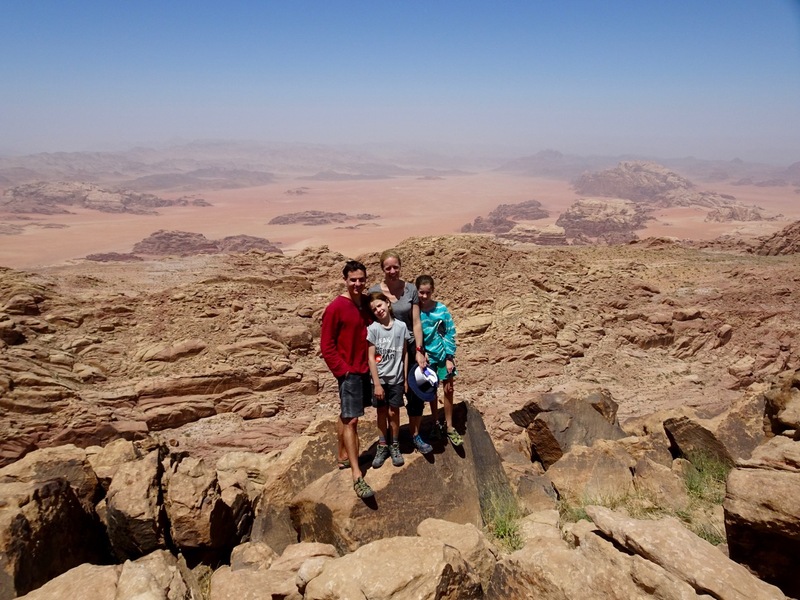 The Dead Sea is only 40 kilometres from Amman and Emma and I were soon grappling with the reality of navigating in a major foreign metropolis without a GPS. It’s only because of Emma’s genius with electronic devises that we are not still stuck somewhere between the fifth and sixth circle (Amman landmarks) and cursing one way streets. The Lonely Planet website says, ‘Only the brave or the foolhardy would sit behind the wheel in Amman, where driving is complicated by extremely complex roads twisting around the contours of the city’s many hills, and is further made miserable by dense, unpredictable traffic.’ Good thing I read that after we were comfortably tucked up in our hotel room that night. We used our one spare day before heading to Greece to check out sights in Amman that were beyond our reach on our first lap through. There is a huge Roman amphitheatre which we admired from a distance owing to the long list of ancient sites coming up for us in the near future. But we got up close and personal with the remains of the Temple of Hercules perched on a hillock at the centre of town. We used Uber for the first time to get ourselves to the airport the next morning. It was a bargain by comparison to the taxi’s, or at least it would have been had the driver not told us a long sob story about how he made no money taking people to the airport because of all the overheads associated with renting a car to drive etc. We felt bad for him, so gave him a little extra which made it cost about the same as a taxi. Ce la vie. Our last hours in Jordan were spent in the Royal Jordanian airport lounge snacking on olives and yummy bread. It was Friday the 13th, good thing we are not superstitious. Next stop – Athens! Well now I’m lost, I finally admitted to myself. 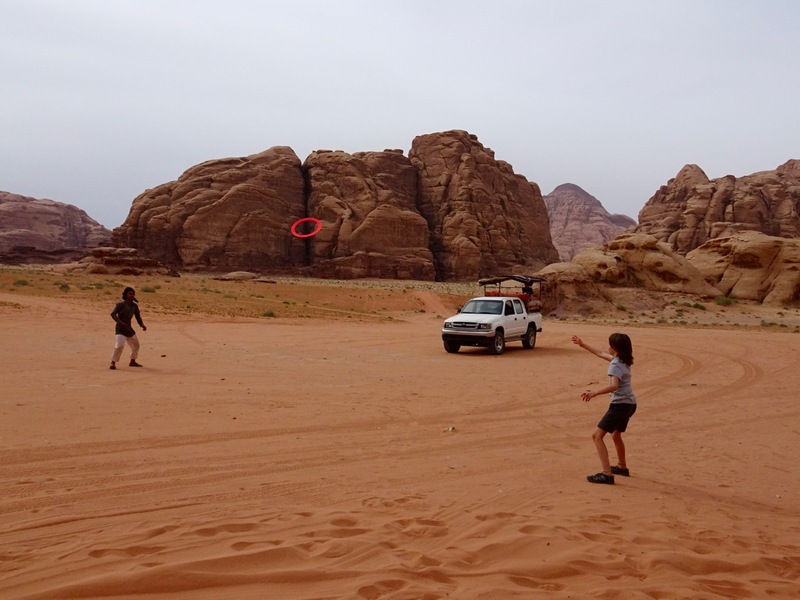 For the past day and half I had been instinctively endeavoring to memorise cliff faces, track junctions and other markers in the huge, wild, remote, dry and enthralling Wadi Rum – a 720 square kilometre wilderness in the deserts of Jordan. I had been trying to keep a mental track of where we were because we were headed into more and more remote territory. No signs, no roads, none of the usual landmarks with which to orient yourself. The vast expanse of desert was like a maze. 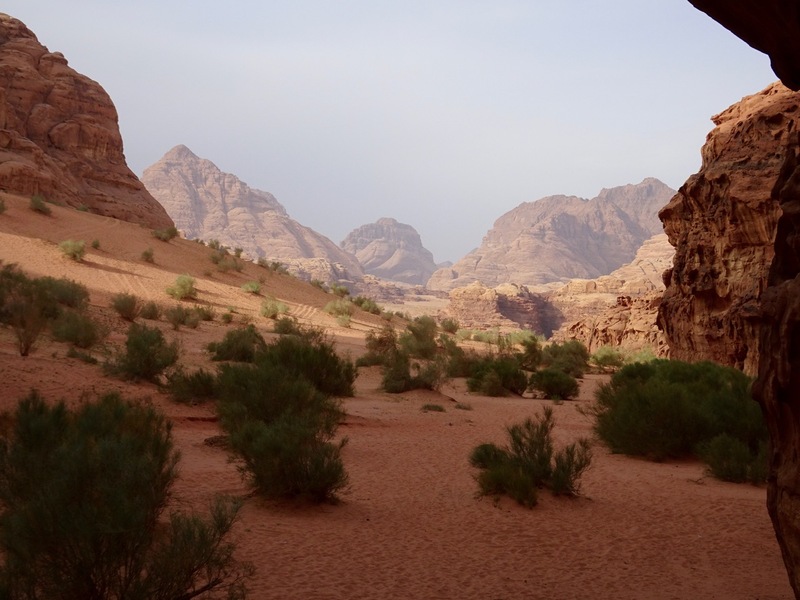 Tracts of gently undulating sand, kilometers wide, formed valley floors punctuated dramatically by massive rocky outcrops, up to 800 metres high. They disappeared off into the distance in every direction. I wished I had a map. I am usually more comfortable knowing exactly where I am. I trusted our guide to know his way around, after-all that was what we were paying him for, but he seemed very young and he didn’t speak all that much English. How many times could he have done this before? The beaten up old Toyota Hilux in which we were riding in the tray back also did not strike me, on first impressions anyway, as the most reliable vehicle in the world. It did have personality though and was comfortably fitted out for carting foreigners around with cushioned seats and a thick blanket stretched across a metal frame overhead to keep us in the shade. Fortunately for my peace of mind, by the time I conceded that I really couldn’t navigate our way back to where we had started I was also convinced it wasn’t going to be a problem. 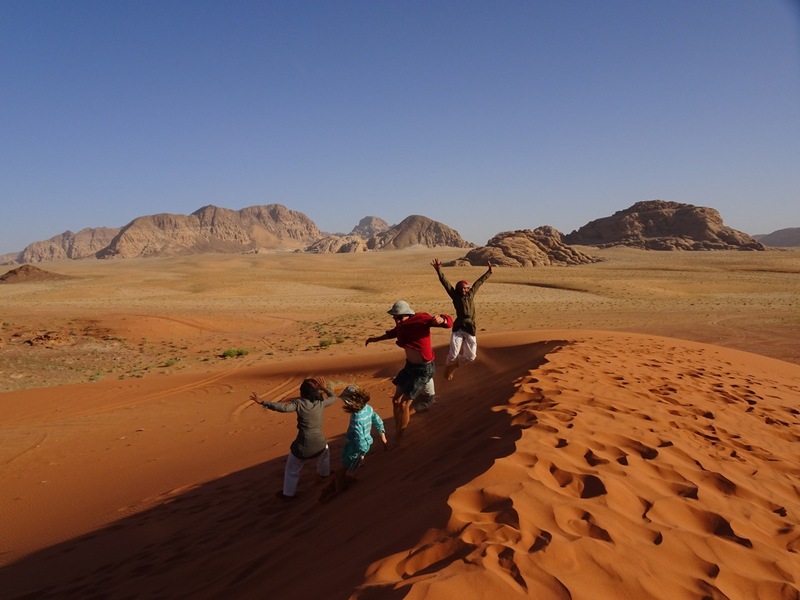 Yousef may have been young, but he had clearly spent his life growing up with Wadi Rum as his backyard and he never hesitated or faltered in delivering us on our way on this magical mystery tour of the desert. It was a wonderful experience, rich in history, culture, geology and ecology and all in a stunningly beautiful landscape. It’s the colours I love the most. Pastel shades of yellow, orange, red and purple which merge into and out of one another in that wonderful way that only nature can. 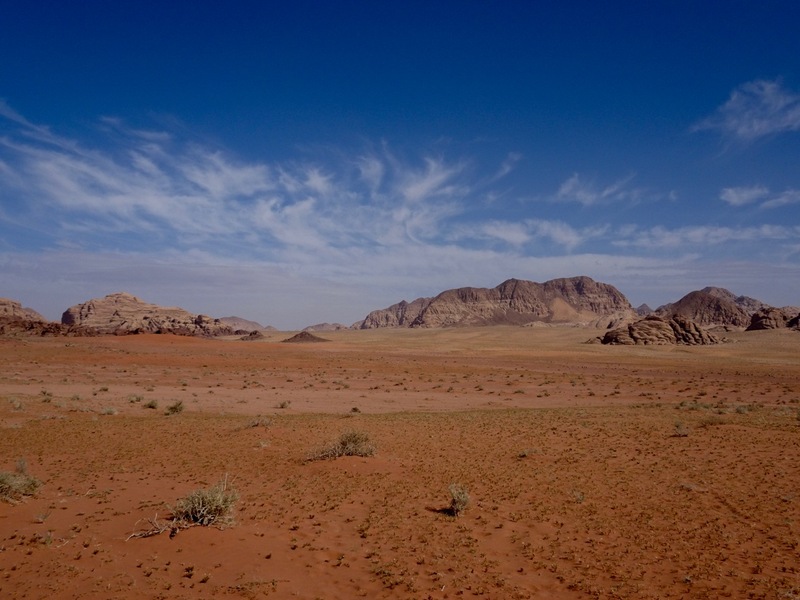 The desert scene was set off by a deep blue sky and faint tinges of green from the sparse desert plants. It was quiet too. So quiet you could hear the wings of birds tearing at the air as they flew past overhead. Crows were common, circling in groups up above the horizon, or half way up the rock faces and providing perspective to the scale of the rocky monoliths. Swallows and other smaller birds darted around low to the ground swooping like albatross over the waves as they scooped up insects before gaining a little altitude to spot another morsel and swooping down again. 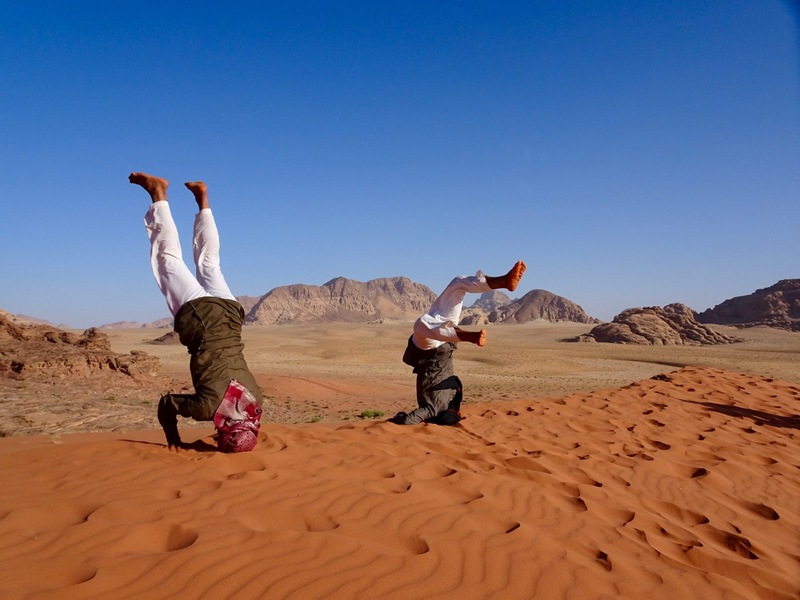 We toured Wadi Rum with an outfit known as the ‘Rum Stars’. The name struck me as more appropriate for a basketball team than the business name of a Bedouin desert tribe, but who was I to question? We finished each day at their desert camp, a series of structures which were not quite a tent but not quite a solid building. Thick black cloth was stretched taught over metal frames providing a surprisingly snug interior, cool in the heat of the day and warm at night. The common area was lined with plush red cushions, with a campfire suspended on a metal platform in the centre of the open sided shelter. A pot of sweet Bedouin tea was constantly on the boil. The hospitality shown us by Yousef and his brothers was far more genuine than I had perhaps expected from a business which sees people like us for a matter of days and probably never again. 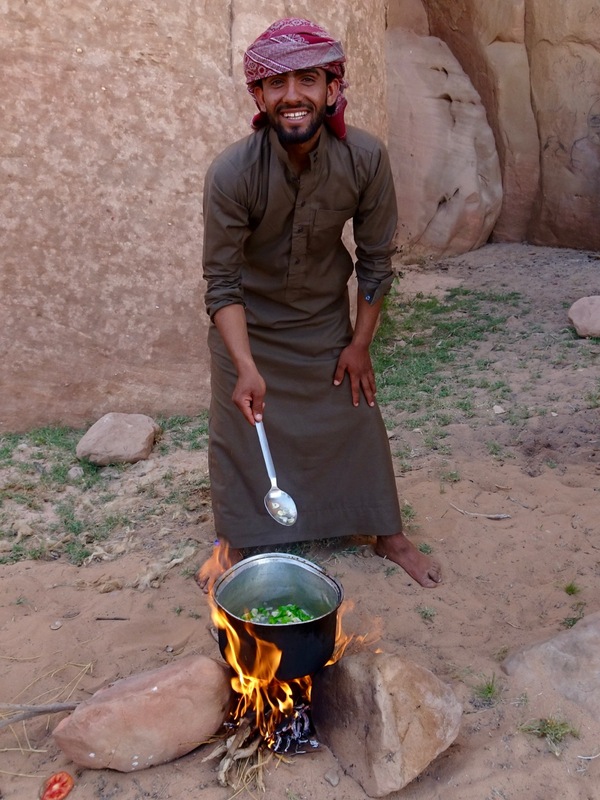 We listened one evening as Yousef’s older brother, robed in a full length white gown and Arabic keffiyeh (headdress), spoke about his desire to show people from around the world his home. His hope was that all who came to visit would then return to their own homes and speak warmly of Jordan and its people. The same brother also spoke lovingly about Jordan’s King Abdullah and his progressive attitudes – towards women, politics and education. He contrasted this sharply with Jordan’s neighbours suggesting that while Jordan may be expensive, people were not imprisoned for expressing a political view and that there was nowhere he would rather live. ‘We love King Abdullah’ he said affectionately. I can’t remember an Australian politician invoking that kind of following. Deserts call to mind barren, inhospitable wastelands of little value or interest to anyone. It’s an unfair and unwarranted reputation. 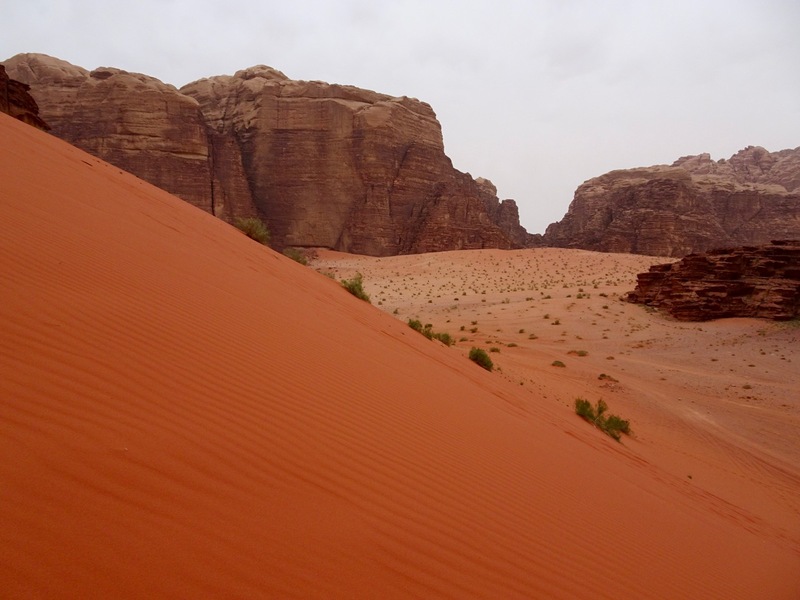 Wadi Rum, like outback Australia, is an enchanting place with more to do than time on offer. 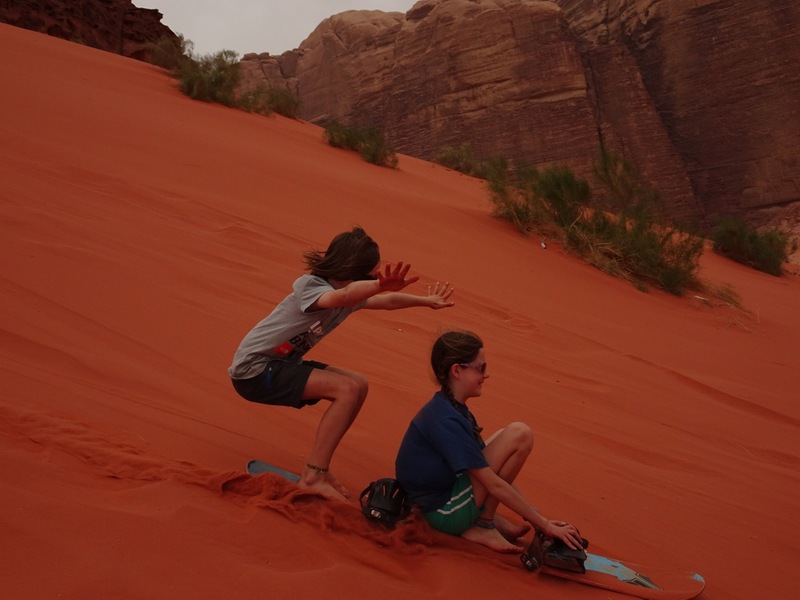 We hiked through canyons, scrambled up cliffs to stand on precarious rock bridges, watched as our guides prepared and cooked meals over campfires at the base of massive rock faces, leapt off the top of red sand dunes, raced across the desert floor at break-neck speed as Yousef tried to outdo his brothers in delivering us and other visitors back to camp. 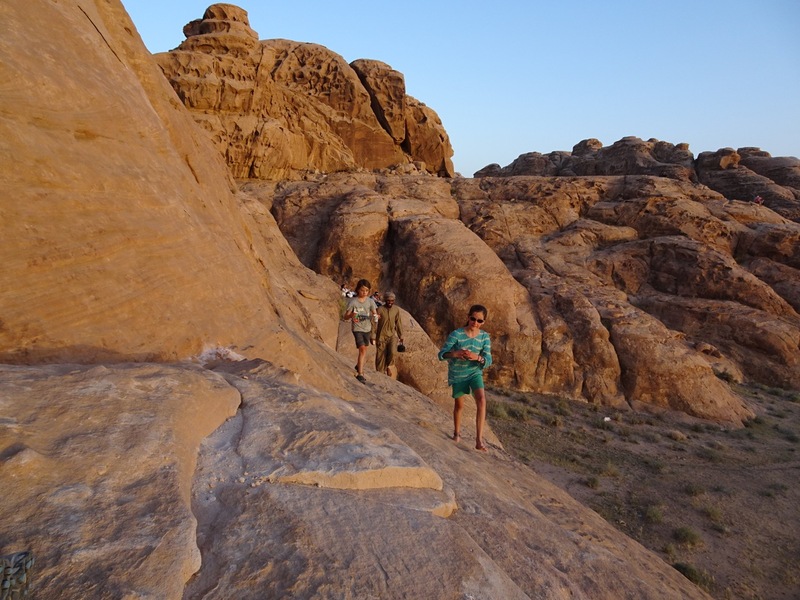 We also soaked in sunsets from high vantage points while Amy and Oliver scrambled up and down the rocks to deliver cups of yet more Bedouin tea. 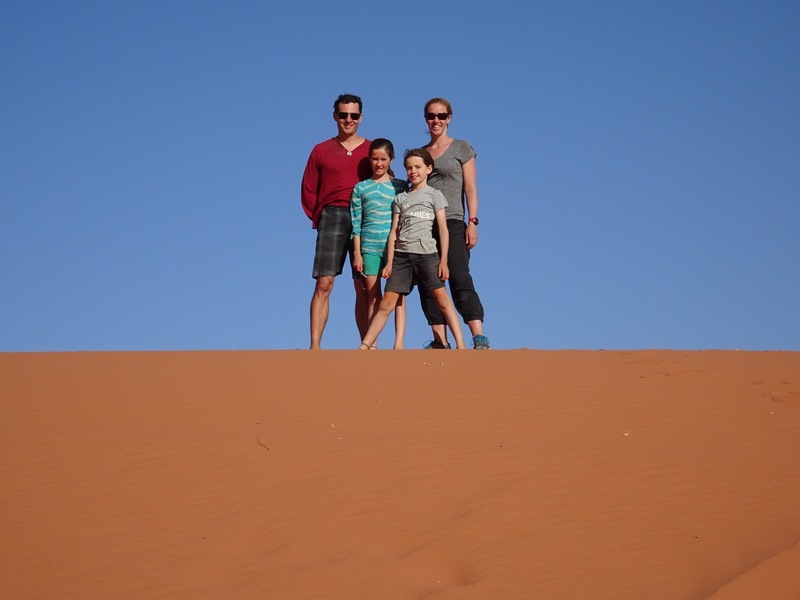 Sand dune leaping – of course! 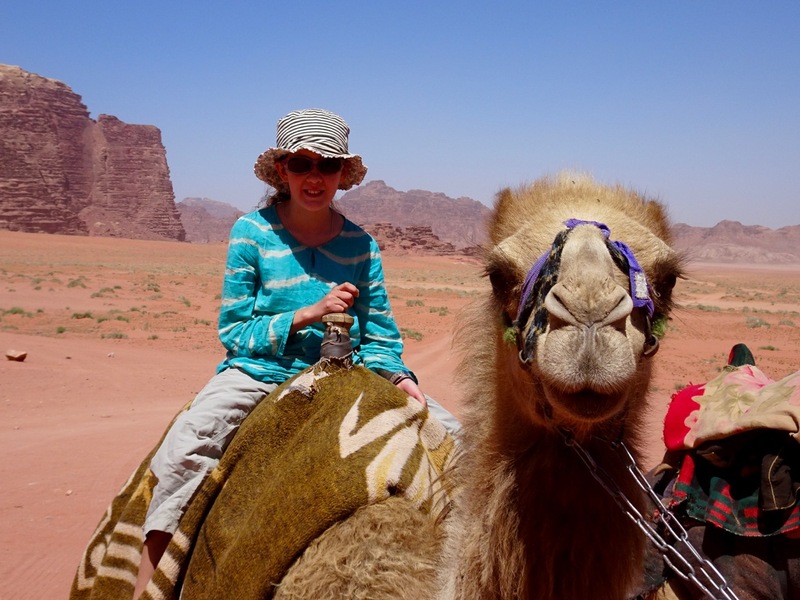 We even spent four hours trekking on camels which was almost, but not quite, too long. It was kind of romantic, and helped evoke a stronger sense of times past. The reality was though that romance came at the cost of a blister on your behind and that made it hard to maintain the dream. We all squirmed to get comfortable on the ungainly but lovable beasties. 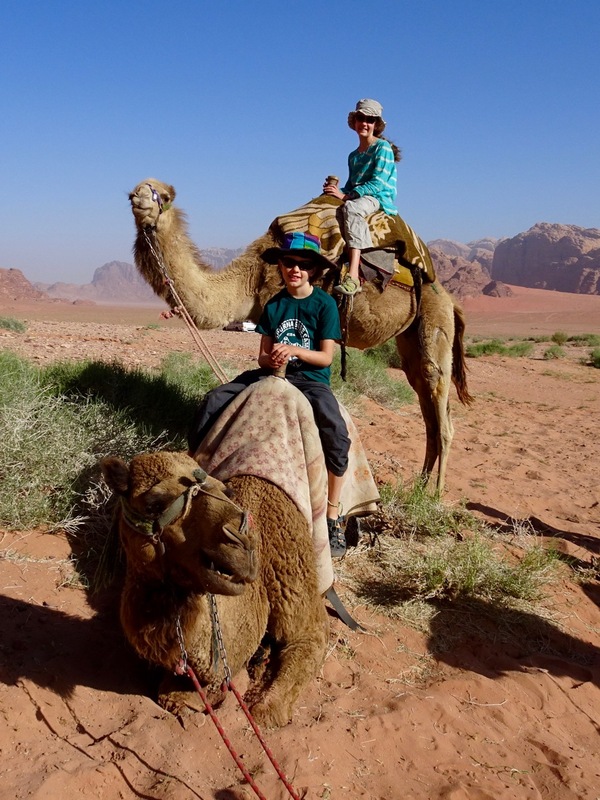 Oliver found it best to ride backward, Amy and I attempted to imitate the cross legged style used by our Bedouin guide while Emma just urged us to keep going so we got to the end as soon as possible. 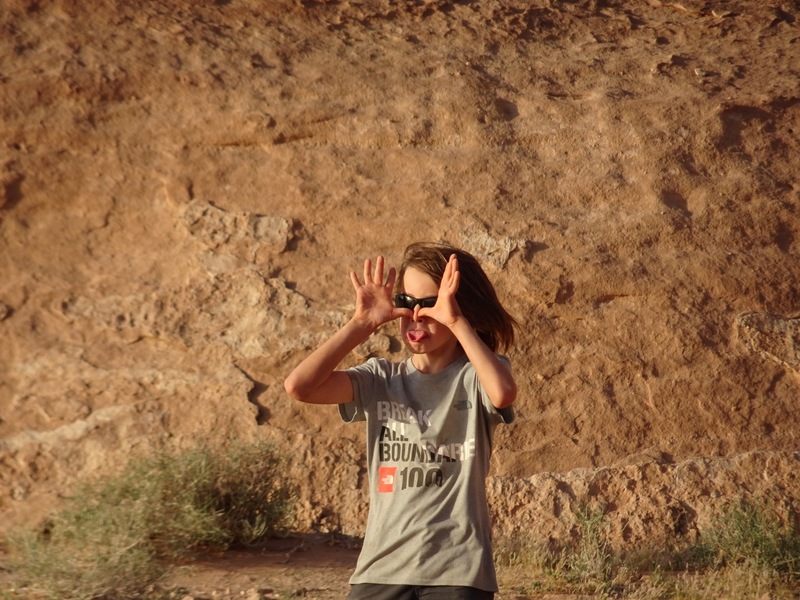 ‘I like the desert’ Oliver declared spontaneously as we raced back from our sunset viewing one evening in the twilight. ‘You get to be all dirty’ he declared with a cheeky grin. Yousef seemed to encourage him in this endeavor. Like an oversize school friend, he seemed very pleased when he found a partner in Oliver to play frisbee with at every possible opportunity. They played hard, diving in the sand to take a catch, or to avoid a throw intended more to make the other guy duck for cover. Sand boarding helped everybody get a little grittier too and has been a favourite past time for Amy and Oliver ever since our first adventure on the dunes of Kangaroo Island. I think I’m still snorting some of the sand that went up my nose when I put my feet down to slow Amy and I up before we screeched across a rocky road at the bottom of the hill. Emma took some video of Amy and Oliver careening down the slopes and Yousef snuck up behind us while we watched it back after exhausting ourselves climbing the slope. ‘Did you get me?’ he asked like a kid who didn’t want to miss out. We also visited places made famous by Lawrence of Arabia, including the remains of his home in the desert and the springs where he apparently took a bath on the 13th September 1917. The springs emerged from the rock about a hundred metres above the desert floor at a line in the rock where sandstone sits atop an igneous base. If you looked closely you could see a horizontal line of greenery contour around various rock stacks where this phenomenon was repeated in other places as well. “so, to get rid of the dust and strain after my long rides, I went straight up the gully into the face of the hill, along the ruined wall of the conduit by which a spout of water had once run down the ledges to a Nabatean well-house on the valley floor. It was a climb of fifteen minutes to a tired person, and not difficult. At the top, the waterfall, Al Shallala as the Arabs named is, was only a few yards away”. 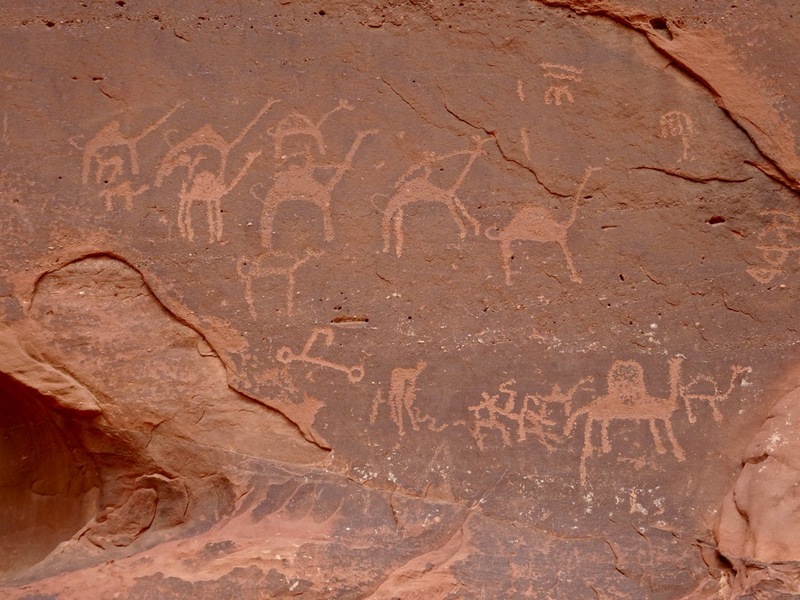 We visited three of those 25,000 rock carving sites. I wondered if those who chiseled their marks into the rock all those years ago had any inkling the world would consider their work of global heritage significance in years to come. Probably not. How could you know? The farthest point of our tour took us to the start of a three hour walk in which we climbed up an unremarkable gorge, scrambled up a reasonably challenging scree slope, across a sun baked plateau before climbing steeply to the summit of a high peak. 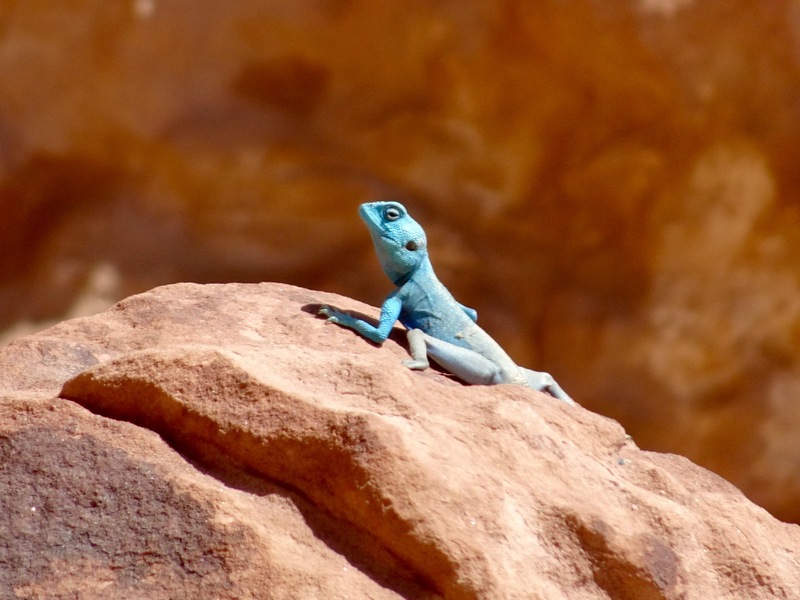 On the climb we spotted an electric blue lizard (the Sinai Agama) basking on a red rock in the sun. The male turns this wonderful colour during the breeding season which I can only suppose occurs around May each year. The view from the summit was spectacular and we gazed off into the distance and into Saudi Arabia. Three days slid past and it seemed like it was all over before it had really begun. 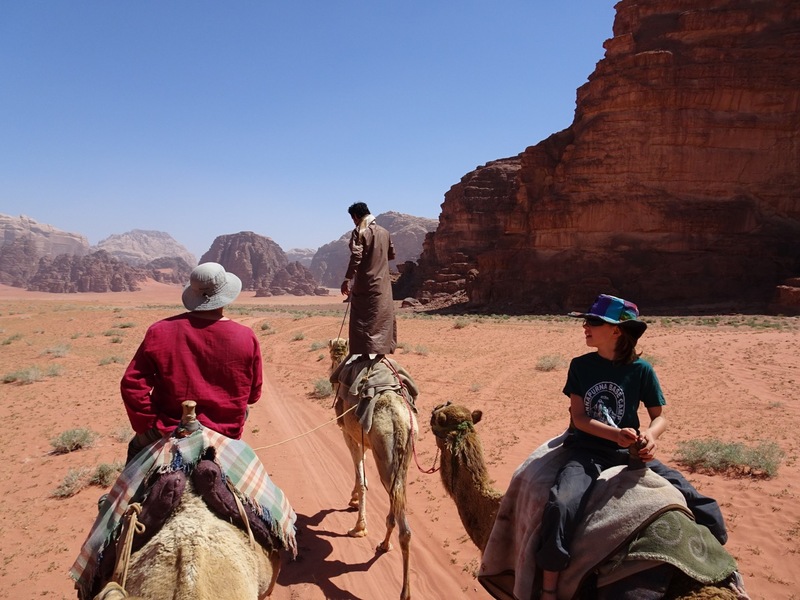 Amy, Oliver and I were really starting to like the Bedouin tea (too much sage for Emma) and we all could have spent much longer hanging out in the desert. Alas it was time to move on. Aqaba and the Red Sea were just down the road and we were off to trade the red rose desert for the sparkling blue sea. The air was choking thick the morning we packed our belongings in Pokhara, and it didn’t improve during the day long bus ride back to Kathmandu. Although our trek to Annapurna Base Camp was undoubtedly a highlight of our trip the smog that sometimes hung heavy, sitting on our lungs and blocking what should have been spectacular views, was an unwelcome reminder of the pressures on our little planet. News reports tell us the monsoon on the sub-continent has failed twice and the lack of rain means there is nothing to scrub the air of the pollutants pumped into it on a daily basis from all manner of sources. Low temperature incineration of plastic and other garbage appears to be standard practice here in the absence of any other waste management infrastructure. I couldn’t wait to get out of the thick cloying air. I also couldn’t help but dwell on how unfair it seems that we have that choice while others continue to breathe it in. A matter of hours after climbing out of Nepal’s choking smog the world had shifted around us. We landed in Sharjah in the United Arab Emirates for a layover before flying on to Amman in Jordan. Women robed in black with only their eyes peering from behind their veils walked the airport corridors while men in white robes and Arab headdress sat in coffee shops. I still marvel at the miracle of air travel and how quickly it transports you between worlds. The opulent Amman airport was a world away from Kathmandu’s basic aging infrastructure and I feel a little ashamed to admit how welcome I found the clean, modern and shiny environment. It was around 10.00pm Jordan time (1.00am Nepal time) as we climbed into a taxi before being dropped off at the house of a friend of a friend in Amman’s equivalent of Canberra’s Yarralumla (with the exception of the armed guards carrying automatic rifles over their shoulders). I’m not sure if it’s convention or regulation, but Amman’s architecture is dominated, almost without exception, by honey coloured square shaped buildings around five or six stories tall. Christina’s place was on the ground floor of a building firmly fitting the mold and although Christina herself was not there to greet us her house was a welcome dose of homely comforts. We spent three days catching up on school work, making plans for the next two weeks in Jordan and plotting our approach to travel through Europe. We didn’t actually move any further than the local supermarket about a kilometre away. The kids cooked us dinner and I washed dishes for the first time in nearly four months. We are very grateful to Christina for ‘hosting’ us when she wasn’t even there! We picked up a rental car the next morning with barely enough fuel to get us to a petrol station. We must have been running on vapour after a few wrong turns and a very circuitous roadwork detour stymied our attempts to find somewhere to fill up. 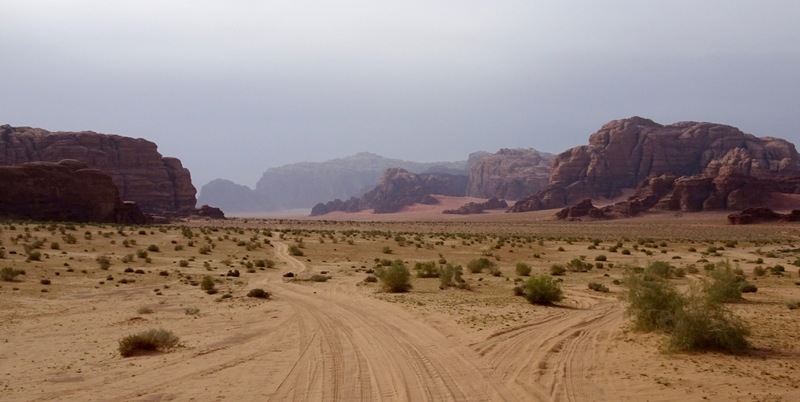 We were however spared the inconvenience of being stalled on the side of the road and were soon speeding our way south on the Kings Highway through Jordan’s dry and barren lands. Petra was on our list of must see places but to be honest I knew very little about it. I guess Emma and I just liked the look of the iconic Treasury building carved into the sandstone cliffs that finds its way into almost every travel book we owned and had drooled over back home. There is a risk with such places that reality is unable to live up to the expectations we create in our imaginations. Were Petra not more than the Treasury this may have been the case, but there is so much more to it. The Treasury is just the gateway, a dramatic building thought to be designed specifically as a statement of wealth and power intended to leave visitors no doubt as to who was in charge in this neck of the woods. It is actually a tomb, likely to have been built for a King and his family, like most of the other stone carved ‘buildings’ of the city. The 1.2 km long ‘Siq’ or canyon which leads down to the Treasury has got to be the coolest driveway in the world. It twists and winds with canyon walls up to and over a hundred metres overhead. Every corner makes you wonder whether the next will reveal the view of the massive sandstone edifice of the Treasury. An involuntary ‘wow’ passed my lips as it finally came into sight. Finally – there it is! Beyond this grand entrance the city continues with more and more building facades, 50 and 60 metres tall, carved into the rocks all around. 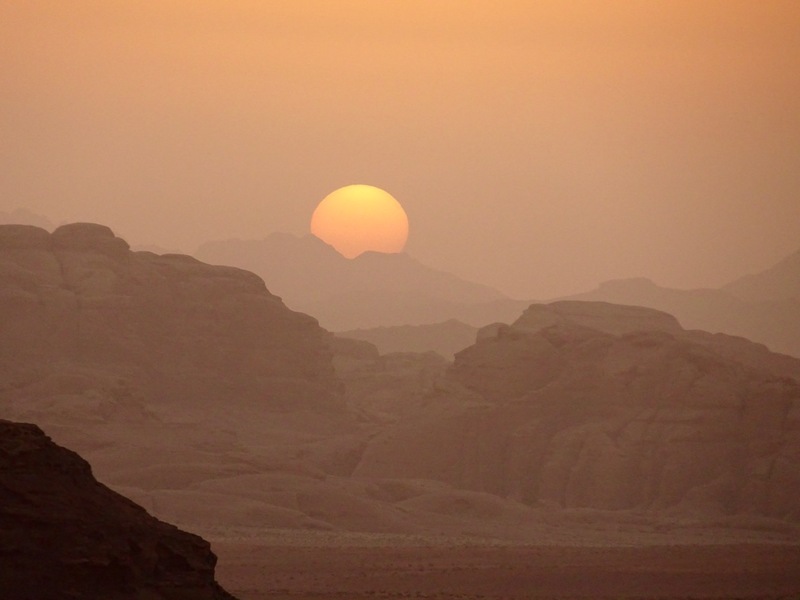 Around 2000 years ago, 30,000 Nabataeans used to call these rocky canyon-filled mountains home. It is a truly remarkable thing how the Nabataeans exploited their geographic location on the trade routes between China, India, the Far East, Egypt, Syria, Greece and Rome to grow wealthy enough to plumb the desert springs and supply water not only for themselves but for camps of up to 500,000 others living outside the city. Throughout the site there is evidence of the engineered water management systems which made life here on a grand scale possible. Lining both sides of the Siq itself are the remains of a terracotta pipeline around 10 cm in diameter falling at a perfectly consistent 4-degree slope. The pipe funneled enough water from the surrounding mountain springs to supply 8 litres of water per day for each person living in the city, not to mention filling grand pools, baths and gardens leading some to call it the Las Vegas of its time. Side canyons in the Siq also bear the remains of dam walls built to protect the city from flash floods and at the top of the canyon a tunnel has been carved through the rock to divert the course of the river channel which created the Siq itself. Having mastered water, the Nabataeans then sold it, no doubt at extortionate prices, to the endless camel trains bearing goods along the trade route from the orient through to Europe. Nabataean society was also curiously progressive for its time, even by today’s standards in many parts of the world. Women were equal to men and played an important role in politics and society. Queens ruled with their husbands and appeared alongside them on coins – apparently the Nabataeans are the only ancient civilisation found to have done this. In the hereditary system of the monarchy, should the king die with an heir too young to take over immediately, the queen would rule until her son was old enough. According to Nabataean law, a woman’s inheritance was also equal to that of a man and women signed business contracts and ran their own affairs. We spent three days trekking into and out of the site up and down the dramatic Siq all the time declining the constant offer of horse, donkey or camel rides. Donkeys are the most common ‘taxis’ through the site and are really quite comical on occasions as they are ridden back and forth by fully grown men on the hunt for business. We were often solicited three times in a little as 30 metres. I started to have a little fun with it, complementing the operators on the quality of their fine animals and thanking them enthusiastically for their generous offer before indicating that on this occasion we have decided to walk. It was a little cheeky I suppose, but so are the unceasing offers which could, if you let them, detract from the whole experience. 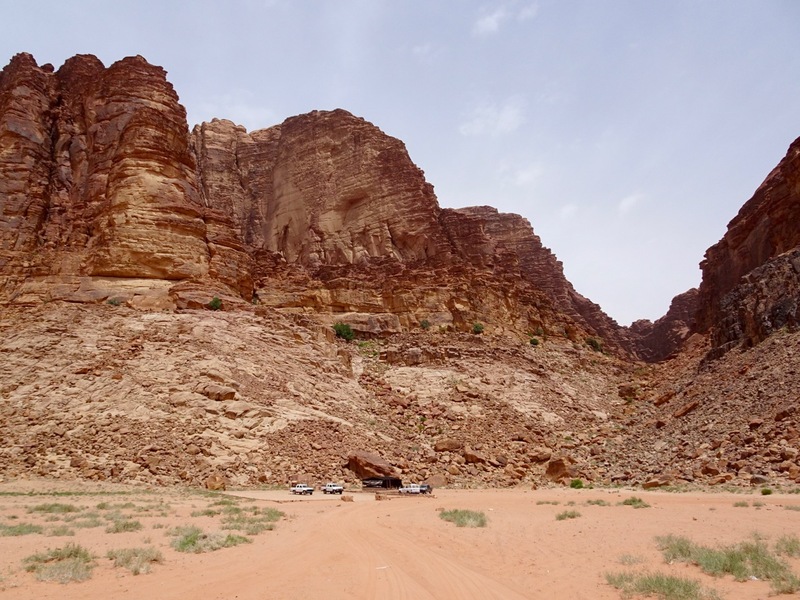 At the far end of the ancient city of Petra is ‘The Monastery’, reached by what we probably would have considered a significant climb up through the canyons if we hadn’t so recently been trekking in the Himalaya. The Monastery itself is the second best preserved and most impressive of the facades carved into the cliffs. We ordered the best tasting flat bread and hummus you could hope for and were photo bombed while taking selfies from the former Nabataean tomb where the little café had its chairs and tables. Beyond the Monastery are a series of viewpoints which knocked my socks off. Perched high above the Rift Valley the view looked out over a huge gorge onto the plains beyond. We were told we were looking down into Israel to the left and Palestine to the right. I had to say it to myself twice for it to sink in. Here we were standing in Jordan looking out into Israel and Palestine. Who would’ve thought? !